Hall Pass debuted this past weekend, a movie which I was HIGHLY anticipating. When that happens the bar usually is set too high, then you’re let down, which is the case here. The movie was good, not great. Funny, not hilarious. It was definitely worth the “first run” money, but I don’t think it’ll have the legs of an Animal House, Caddy Shack, or even The Hangover. The writers and directors had good intentions, and a great premise, but after a while, it seemed as though they didn’t know how to connect the dots. In the middle it seems more like some skits tied together than a flowing movie. There are some REALLY funny scenes (Rick and Fred in their snooty friends house, Fred taking out the garbage, and “fake chowing” to name a few), Fred definitely “makes” the show, and in the end there is lesson to be learned. Hall Pass is the story about two married men Rick (Owen Wilson), and his best friend Fred (Jason Sudeikis) who’s over sexed imaginations get them both a “hall pass.” This “pass” by their wives Maggie (Jenna Fischer) and Grace (Christina Applegate) allow them to have a week of pre-marraige life, back to the good ole days – BACHELORHOOD. Rick and Fred along with their vicarious living friends go on the hunt, and that’s when things get out of hand. The wives take off for the Cape, and might have some “living” to do as well. Even if during the movie the ending seems inevitable, it’s still a fun trip getting there. So, if I were to give it a rating, I would give it 3.1 stars out of 5. Go and see it, make a night of it, and have fun, if anything it will help shake the winter blahs. 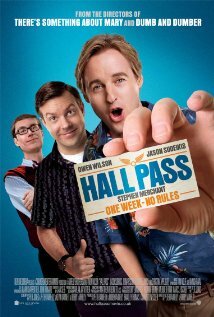 This entry was posted in movie review and tagged comedy, Hall Pass, movie review, Owen Wilson. Bookmark the permalink. Come on….give it an extra 1/2 star for the “set” from down under! Has the smart, relaxed, real-life drive of the Farrellys’ best comedies. (There are even two poop sight-gags that are shockingly funny.) Too bad the wives’ storyline is so unfunny and uncomplicated. Good review, check out mine when you can!